Richard Frary Plumbing and Heating | Plumbing & Heating, Kitchens and Bathrooms. Oil-fired Boiler Installation, Servicing and Repairs. A well-established plumbing and heating company, also fitting kitchens and bathrooms. We pride ourselves on providing professional, excellent customer service and attention to detail with all work. New bathroom and kitchen installations – from straightforward replacement or full service including planning and design, all tiling and decorating. 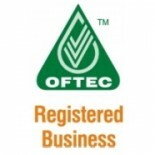 OFTEC registered for all oil boiler and oil tank work with additional Workmanship Warranty for new installs. Full 7-day callout service provided for Dereham and surrounding villages, for central heating issues and plumbing emergencies. All work guaranteed for 12 months with additional guarantees from manufacturers. Fixtures and fittings supplied from leading brands and where possible, from UK companies. All work is carried out with minimum disruption possible, and your premises left clean and tidy at the end of each day.